Lovely development. Customer Services are very helpful. Ravenscourt Park is moments away with Hammersmith Broadway providing all transport needs right on your doorstep. They even have a handyman available for free to help to assemble furniture, etc. for 2 months after completion. This is a great location for getting to different places but not wonderful in itself. It is great as it is right by all the tube connections of Hammersmith and near the A4 to quickly get out of London to the west. You have the Apollo on your doorstep, Ravenscourt park a short walk and then within ten minutes in different directions you can get to Shepherds Bush for Westfield shopping, Brook Green for some great pubs, Chiswick to the west for shops/restaurants and bars and then south follow the river and pubs to Putney. However it is right on a busy corner where cars queue up in the morning and evening commute to get around Hammersmith roundabout, it is almost sitting on Hammersmith King Street which is the least desirable high street in the surrounding area. They seem from viewing to be nice apartments but if I could afford to be a little further set away from the roundabout and king street I would. Sovereign Court is a new large scale luxury development comprised of 1 or 2 or 3 bedroom flats located in the west of London in Hammersmith. Sovereign Court is the latest in a string of recent developments in the area. The development is comprised of several mid rise structures containing 416 flats, with some retail expected to open soon on the ground floor. Sovereign Court includes many amenities for the residents a landscaped garden, a fitness centre, and 24 hour concierge service. There is also an underground parking structure in the building. Parking is not included and is offered for GBP70,000 to owners of the 3 bedroom apartments. The standard finishing of the flat includes Sky or BT Broadband, marbled bathrooms, a sound system found everywhere but the bathroom, Sky + HD and a 42\” LED TV in the bedroom and living room, in unit washing machine and dryer, and Siemens appliances in the kitchens. 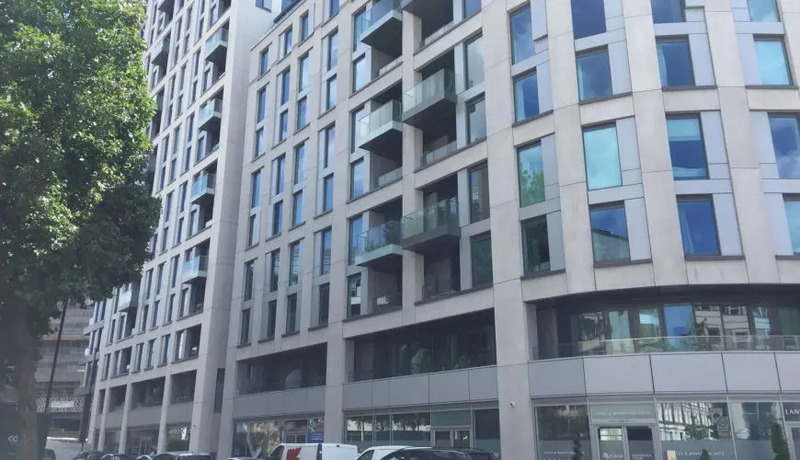 Some of the more expensive flats are fitted with more luxurious fittings, such as Miele appliances, full home automation system, plush carpets, and 70\” LED TVs. In terms of location, Sovereign Court is located within walking distance to Hammersmith Underground Station, with access to four different tube lines. There are also the shops, restaurants, and amenities of Hammersmith Broadway. If the landscaped gardens are not enough, there is also Ravenscourt Park nearby. Because of its location, the tube tracks running behind the development, and the close proximity of the Hammersmith flyover, the area is very noisy and very congested. However, the flats are well insulated from noise so one may not notice too much. 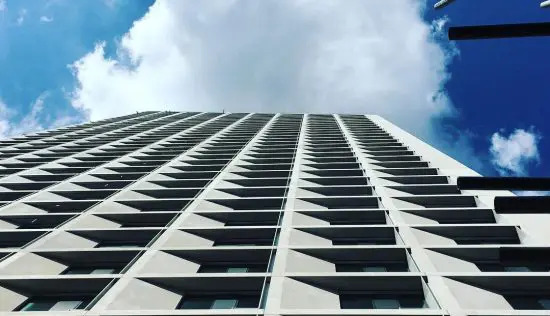 Furthermore, due to the high number of flats in the development (416), the amenities like the fitness centre and the landscaped garden could become overcrowded. 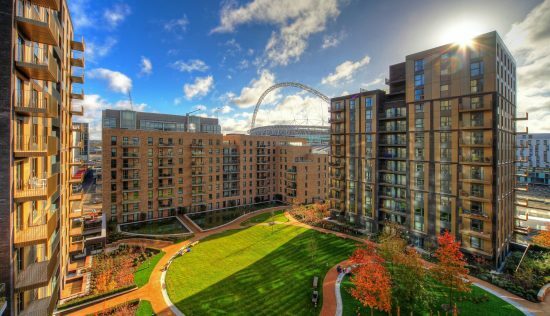 Flats in Sovereign Court start at close to GBP1 million and go up all the way to 5.5 million for a 999 lease, with ground rents varying from GBP225 GBP450. There is also an annual service fee of GBP3.50 per square foot. As the nature of my work requires travelling to Heathrow and Central London , I have moved into the Lancaster House within the Sovereign Court development a few months ago . Sovereign Court is located in the centre of Hammersmith , which is a major transport hub with an underground interchange (Picadilly, District, Circle, Hammersmith and City Lines ). I could travel to Central London in just under 20 minutes , without worrying that I will be late for work . The direct connection to Heathrow Airport also makes travelling easier for me . In addition , it is a very short safe walk from the tube station . Sovereign Court is also located in a quiet residential street . Moving into Lancaster House was easy as the concierge team was always there to help . Whenever a parcel is due for delivery , I do not need to be at home to wait for it . The concierge always store it for me , and I can collect at my convenience . Working long hours everyday would mean that I have to keep my lifestyle healthy . Just a few steps , I can workout at the gym located just below my flat . On sunny days , I choose to jog down to the Furnivall Gardens and along River Thames . The apartment is superbly designed . As I work from home , the spacious living area is perfect . There is an open plan fitted kitchen where I can cook . Besides that , the kitchen leads to the private terrace offering exceptional views of the London skyline . Speakers are not installed , but wiring is provided for the Sonos speakers I bought . Over the summer , it was not too hot as the apartment has comfort cooling . Although the rail could be heard sometimes in the distance , the walls dividing the other apartments is soundproof . The communal area is also nicely decorated and there are two lifts serving the 13 storeys high building . While the Kings Mall is under refurbishment , there are numerous high street shops and restaurants nearby providing a variety of choices . On some day off , I would choose to dine out at other restaurants which are located just less than 20 minutes away by tube . During the weekends , I usually meet up with my friends at riverside pubs such as Rutland or The Dove which is a walk away . As a young professional, I chose Sovereign Court because of its fantastic location first and foremost. Hammersmith station and four tube lines are just a quick walk from the property. The area around Sovereign Court is also filled with shops, pubs, restaurants, and even the Apollo Theatre is close by. There are some ground floor shops due to open and should add more options to the area. It is safe, even when I come back late at night. For the quieter and sunnier days, a stroll through Ravenscourt Park is absolutely lovely. While its location means that it can get quite noisy (and there are tube tracks running next to the building), I generally dont notice the noise much and have found my flat to be fairly well insulated. Another advantage to living in Sovereign Court is the high quality flats. Since the property was recently completed, my flat is brand new and has very nice, luxurious elements, flat screen TVs and a sound system. There are good quality appliances, deep-pile carpets, quality fixtures, and high-end finishing touches. The property also has a landscaped garden, 24-hour concierge service, and a fitness centre for all its residents. While these can sometimes become crowded, they are generally bearable. While there is no parking, I do not mind it since I do not own a car. I find the monthly service charge to be a bit excessive, especially since there arent that many amenities. So far, I have really found Sovereign Court to be a great place to call home. I find it to be perfectly priced. It is hard to find brand new, luxury flat with amenities like fitness centre, landscaped garden, and concierge service for that price in such a well-connected and accessible area. I say for those interested, act fast because flats here will sell quickly. 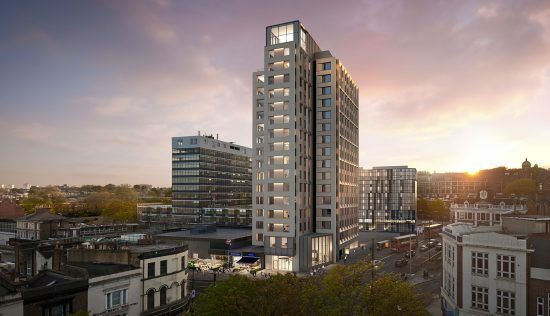 Hammersmith, home to very busy shops, restaurants, Eventim Apollo, and many head offices has welcomed Sovereign Court as a modern new development. This trendy development has elite or penthouse apartments to offer in addition to some commercial space on the lower floors. The elite space offers basic amenities such as fridge, dryer, TV, moodlighting, recycling bins, etc in an uber stylish apartment. There is a point for SKY+ connection in the lounge thereby eliminating the need for any installation of wiring for the set top box. The kitchen is custom fitted with Siemens appliances and the apartments are ventilated with subtle yet dazzling interiors. In addition to the facilities available in elite space, penthouse offers the extremely desirable automation system, television in the lounge, and access to a terrace offering breathtaking skyline views. Exteriors of the development are to be surrounded by landscape gardens. It also offers a 24-hour friendly and proactive concierge service and a private gym. The Sovereign Court concierge delivers and picks up mails from the designated post boxes on every floor, which saves the trouble of looking for your mail or misplacing it. The whole look of the apartment has been paid attention to including the corridors that are well decorated. Parking space is not an issue as there are over 650 spaces available at the underground parking and exclusive spaces for residents will also be available. It is not advisable for residents owning vintage or luxury cars to park their cars at a public car park as it is at their own risk. The strategic location of the development makes it supremely attractive for families, students, as well as single working men/women. There are numerous schools in the locality especially desirable for those parents who do not mind spending money on quality education. Hammersmith tube station is just a 5- minute walk connecting the development to central London in less than 30 minutes (with one tube change) This can be a great incentive for people working in central London as they can get from home to their workplace without paying the congestion charge. It is well connected to the top universities in London like Imperial College, UCL, LSE, which may seem attractive to students however pure student living situated within close proximity can influence students decisions. A short walk from sovereign court leads to the stunning views of Hammersmith bridge on river Thames and Westfield is less than 5 minutes away (tube) The location may act as an disadvantage when one has to commute to north or east London as the travel time is significantly high. Overall, the interiors are nicely done but the living room may appear to be a little cramped due to the many facilities provided. Priced between 1.5m to 5.5.m pounds approximately the apartments provide value for money. This development is like a fresh breath of air for Hammersmith but is not any different from the ones located elsewhere in London. Sovereign Court is definitely a nice development. I remember I loved the building when I first saw it. The apartments are brand new and finished to a high degree of quality. Having a fitness centre, 24-hour concierge, and landscaped gardens are a definite plus and can be really convenient, especially for someone like me who doesnt have much free time during the day. It is located walking distance to Hammersmith tube station, Ravenscourt Park, and many shops and restaurants of Hammersmith, making the location certainly very central. You can find everything you need from vegetables to clothing just a quick stroll from the flat. If we ever want a change from Hammersmith, there are 4 tube lines taking us all over London Central London and Heathrow are all-accessible using the Piccadilly Line. I imagine living in Sovereign Court with kids would be failry easy as it is easy to access the building with a pram and since the apartment is brand new, there are no particular hazard areas for children. The big negative of living in Sovereign Court would be the lack of parking for residents. It is very hard to find parking in the area! Also, while the area and amenities are great, the building is located in a very busy and noisy area and this is without the commercial spaces opening yet! I imagine that when the shops open on the ground floor, the area will become busier. For its price, I found Sovereign Court to be a bit overpriced its flats are nice but its location despite being convenient is too busy. Sovereign Court in popular Hammersmith contains 418 one, two and three bedroom apartments in total set across 15 storeys. Prices range from around GBP550,000 to GBP5million, which works out at around GBP1,159 per square foot, just slightly over the average for W6. The project was developed by Berkeley Group, with a team including architects Lifschutz Davidson Sandilands and landscape designers Randle Siddeley and Associates. It also contains 5,000 sq ft of retail and restaurant space, creating a sense of community for the residents. 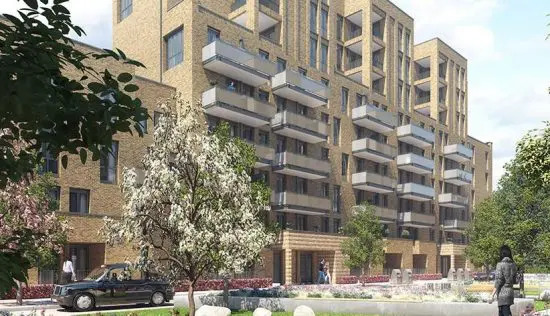 Families will particularly be drawn to this area of West London, known for its excellent schools, abundant green space along Beadon Road and Glenthorne Road, and buzzing high streets filled with independent shops and eateries. Its relatively easy commuter routes will also be appealing to young professionals who are looking to get a foot on the ladder in a leafy neighbourhood. The interiors within Sovereign Court aren’t the most inspiring, featuring a greige colour palette and shiny gaudy fabrics that lessen the luxe factor. The fitted kitchens include stone worktops, Siemens appliances, integrated fridge freezer and dishwasher, freestanding washer dryers, and a wine cooler. Meanwhile, in the bathrooms you’ll find marble wall and floor tiling, Villeroy and Boch sanitaryware, Vado brassware and a bespoke vanity unit. Theres comfort cooling throughout, which comes in useful in the summer months, and a sound system that plays to all rooms excluding the bathrooms is a welcome addition. In terms of facilities, theres a fitness suite along with a 24 hour concierge service to help out when needed. Finally, if purchasing a 3 bedroom apartment, you can pay GBP70,000 pretty steep for this area to park your car on site. 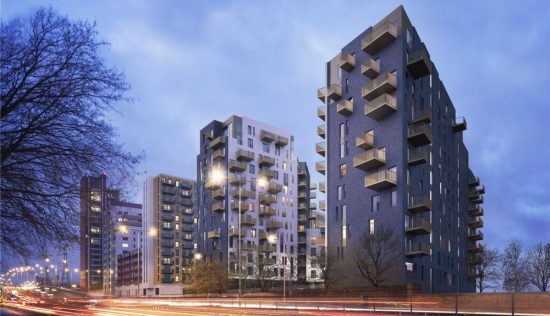 The development sits 150 metres from four Tube lines, accessed from Hammersmith station Circle, District, Piccadilly, and Hammersmith and City. From here, the West End, the City, mainline London stations, Eurostar services from St Pancras International, and major airports like Heathrow can be easily reached. Hammersmith is also well connected to major roads such as the A4, M4 and M25, making Sovereign Court a good choice for frequent travellers. There is plenty of shopping locations nearby, including Kings Mall and Westfield, along with a wealth of eateries and bars to relax in. Evenings and weekends can also be spent exploring the Thames Path around the distinctive green and gold Hammersmith Bridge, with its accompanying waterside pubs. Parents looking for top schools for their children will find Godolphin and Latymer directly opposite the development. Other developments to consider in this area are Queen’s Wharf and Kings Row.